Posted on April 17th, 2009 by webmaster. 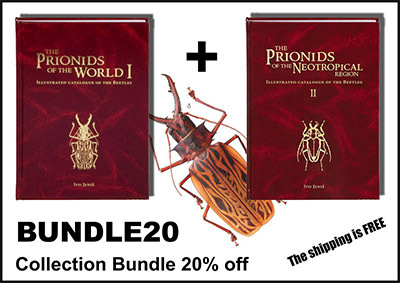 This website is solely devoted to the Prionids Collection — the series of entomological books dealing with the group of beetles of the subfamily Prioninae (a.k.a. Prionids). Posted on July 13th, 2009 by webmaster. Finally our on-line store is fully functional and running so now you can enjoy all the comfort and features of a fully-fledged e-shop solution. You can place an order for any books of our production and get them at the lowest prices because you are buying directly from the source and on top of that we'll give you one more special bonus.